A "Smart Defense" for NATO is an "Invincible Defense"
the commitment to Afghanistan through transition and beyond;ensuring the capabilities needed to defend the NATO community population and territory and to deal with the challenges of the 21st century; andstrengthening the alliance's partnerships across the globe. Read more A major stumbling block to achieving these goals is the extensive financial cuts facing most militaries today. In order to mitigate the effects of austerity, NATO leaders are proposing "smart defense" programs that maximize resources by encouraging NATO members to share key capabilities. Such sharing includes coordination of strategies to combat improvised explosive devices (IEDs); to counter and defend against chemical, biological and nuclear weapons; and to enhance methods of medical support. However, it is hard to imagine that the Summit participants – or other conventional military thinkers – will be able to develop lasting solutions capable of fully protecting their nations from all the many diverse threats endangering them today. As demonstrated by recent terrorist attacks in Europe, conventional approaches cannot provide an effective defense against suicide terrorists willing to die for their cause. "Terrorism cannot be eliminated by destroying the terrorists. Any step in the direction of destruction only helps to create more terrorists. More terrorists only result in more waves of destruction. There is no wisdom in initiating a continuous theme of destruction in the name of protection. Prudence dictates eliminating the underlying cause of terrorism, war and all types of violence – collective social stress." NATO leaders today have the option to consider and adopt a new, surprising, and scientifically-verified method to reduce such stress. It is called Invincible Defense Technology (IDT) and has absolutely nothing to do with bullets, bombs, or killing. In fact, it has the potential to diminish the role of these approaches in the provision of national and international security. Extensive research published in the scientific literature has repeatedly demonstrated the effectiveness of IDT in reducing conflict, open warfare, and terrorism. IDT applies specific "technologies of consciousness" – the Transcendental Meditation (TM) and TM-Sidhi programs, non-religious meditation techniques practiced worldwide by members of many countries and faiths – to produce societal coherence and eliminate conflict. In a military context, when large groups of military personnel learn and apply these technologies of consciousness, high levels of collective national stress can be immediately and significantly reduced. In the summer of 2008, coauthor Dr. David Leffler was invited to present a provocative paper about IDT at the "International Sociological Association Research Committee 01 Seoul National University & Korea Military Academy International Conference on Armed Forces & Conflict Resolution in a Globalized World" and at the Korea Institute for Defense Analyses (KIDA). The paper was entitled "A New Role for the Military: Preventing Enemies from Arising – Reviving an Ancient Approach to Peace." Following the presentation, the paper received worldwide press attention, including publication in the Pakistani peer-reviewed The Journal of Management & Social Science. Perhaps the IDT paper caught the attention of the world press because IDT is totally unlike any other defense technology. The goal of this unique, scientifically field-tested, brain-based technology is to prevent crime, terrorism, and war. Extensive research shows that when IDT is correctly applied, the disturbingly high levels of collective societal stress thought to be responsible for such social problems are greatly reduced. When people – particularly national leaders, who ultimately reflect the collective will of the people they represent – become less stressed, they think more clearly and are better able to resolve their differences amicably. In an environment of less stress, even staunch adversaries may find ways to overcome differences. This transformation occurs when a military creates a large group of warriors (called a "Prevention Wing of the Military") trained in IDT. "Invincible" means "incapable of being defeated." Once these Prevention Wings have become fully operational, the collective practice of IDT by these groups neutralizes the societal stress giving rise to conflict and enemies. Consequently, as the theory behind this concept envisions, no enemy can then be born – and with no enemy left to fight, the military becomes invincible. Readers new to the IDT concept can read more about it in an article on Ecuador's Military Prevention Wing: "Combating Stress in Police Work and Preventing Crime, Terrorism, and War." 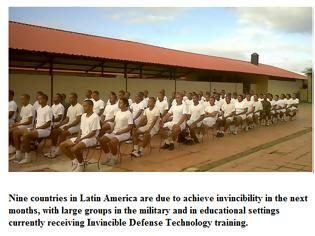 Perhaps due to Ecuador's precedent, nine Latin American countries are due to achieve a statistical level of invincibility in the next months due to their IDT deployments in military and educational settings. Dr. Hagelin and Captain (Ret.) Ray Seebald, a former U.S. Coast Guard Captain of the Port of Chicago and a military aide to Presidents Ronald Reagan and George H.W. Bush, recently spoke about IDT during the second Nuclear Security Summit in Seoul. The main points of Dr. Hagelin's presentation are available online on a previously recorded video: http://www.istpp.org/military_science/Hagelin_military_lecture.html. GUSP is a coalition of Nobel laureates and leading scientists founded to avert the growing threat of nuclear proliferation and nuclear war and to promote safe, innovative, scientifically-proven technologies for national security and global peace. In the video, Dr. Hagelin showcases the results of more than 50 published studies verifying the effectiveness of IDT for international security and peace – an approach that neutralizes the acute ethnic, political, and religious tensions that fuel violence, terrorism, and social conflict. "In recent years, a powerful, innovative approach to peace has been extensively field-tested – in the Middle East and throughout the world," Dr. Hagelin says. "The consistent result has been dramatic reductions in terrorism, war, and social violence. These findings have been replicated, published in leading academic journals, and endorsed by hundreds of independent scientists and scholars. The efficacy of this approach is beyond question." Dr. Hagelin asserts that the extensive IDT research indicates that IDT operates at the Planck scale, specifically at a level a thousand million million times more powerful than the nuclear force. From this level it can easily overpower conventional technologies of offense – yet it is inherently safe, being based in a completely holistic level of natural law. This most unconventional yet surprisingly powerful technology is readily available for NATO or any other world leaders to implement – and at a modest cost that would fit even the most challenged military budgets. IDT is enormously effective and cost-effective, and the results are immediate. All that is necessary is to provide the proper training for a group of military personnel – or indeed any large group within the country. The benefits extend far beyond the military and national security, and even to economic prosperity for the whole country. The only requirement is to keep the group intact. For more information about IDT: Dr. Leffler and his coauthors Dr. Hussain Khan, Dr. David Orme-Johnson, and Major General (Ret.) Kulwant Singh previously presented an innovative plan for military deployment of IDT in their pioneering article "Create an International Military Yogic-Flying Zone in Kashmir," recently published in Pakistan Defence. "Να τοποθετηθούν τα κόμματα για τη Σύνοδο του ΝΑΤΟ"
Ρόδος: Πήγε στον κρατούμενο γιο της ηρωίνη μέσα σε σαμπουάν!